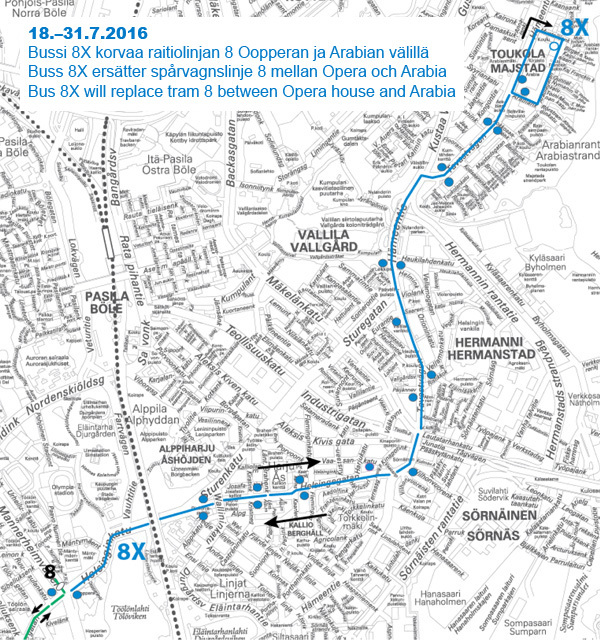 Tram 8 will run only between Jätkäsaari and the Opera House from 18 to 31 July due to construction works on Helsinginkatu. When running from Jätkäsaari to Töölö, the terminus of the tram is at the "Ooppera" 0107 tram stop. The tram leaves from the "Ooppera" 0108 stop. Bus 8X replaces tram 8 between the Opera House and Arabia. 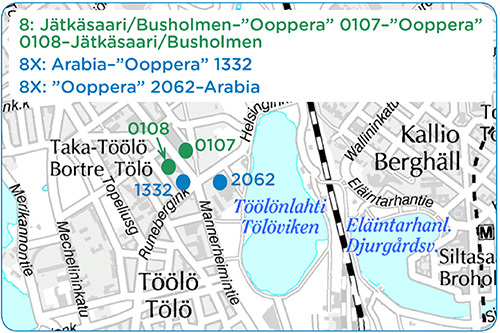 When running from Arabia to Töölö, the bus terminates at the "Ooppera" 1332 bus stop. The bus leaves from the ”Ooppera” bus stop 2062. The bus serves all bus stops along the route.